Lee, Rachel, and Company aboard Satori, a Tayana 37. Welcome to episode 41 of the Shooting The Breeze Sailing Podcast, with BOTH of your hosts, Jeffrey Wettig and Chris Smoker, as we sit down at Davis’ Pub in Eastport with Baltimore sailor Lee Cumberland! 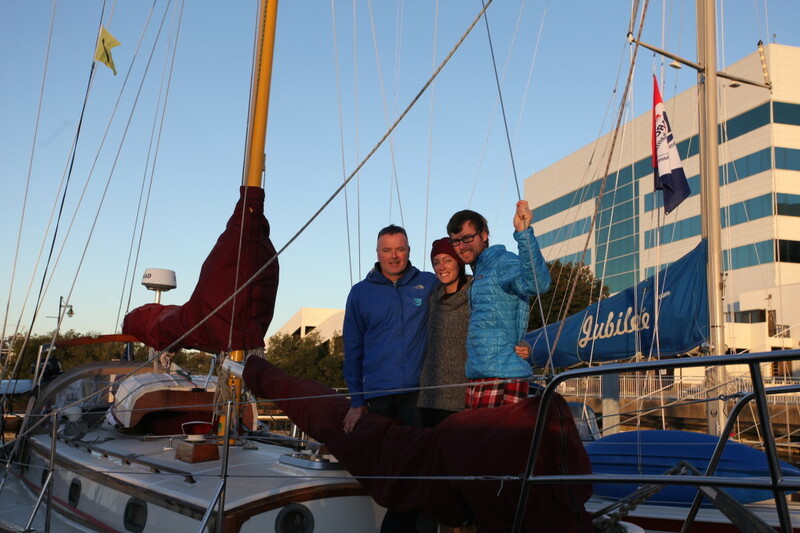 We caught up with Lee after the last day of the United States Sailboat Show held in Annapolis Maryland in October of 2015. I call Lee a Renaissance Man, as he has his hands in lots of interesting ventures, including playing in a Vintage Rock Band, bicycling across the country playing Bluegrass Music along the way, sailing, restoring his 37 Tayana, getting married, and heading off into the sunset on an unknown voyage to the cruising lifestyle. He is interested in getting into the Podcast game ala “The Startup Podcast” which he turned us on to, which will chronicle how they let loose the lines and headed out to sea. Check out his website http://www.beautifulcrazyhappiness.com/. You can download the episode by clicking HERE!